This historic building in the heart of Newberry provided vital services for the residents of Newberry County for over 100 years. The building’s cornerstone was set in 1910 with construction completed in 1911 when the opening of the Newberry Post Office was celebrated. In 1962, the post office services were moved to a larger facility. 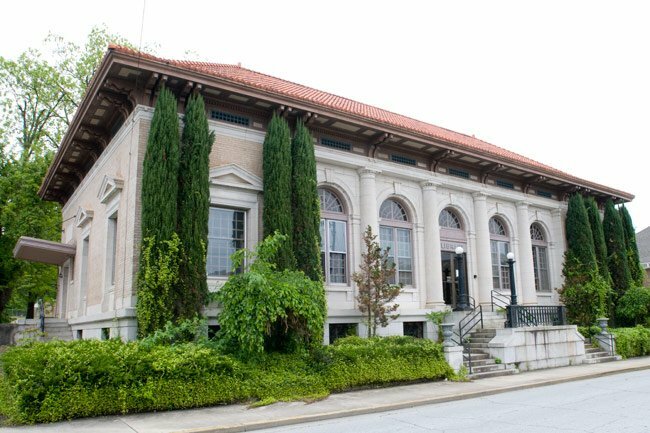 The building remained vacant for four years until the Newberry-Saluda Regional Library acquired the building in 1966, after outgrowing its space in the Newberry County Courthouse. Newberry County was one of six counties created in 1785 from the large district of Ninety-Six. The original plat shows the creation of a public square and by 1801 a small frame courthouse had replaced the first log structure, and the village began to grow up around the town square. Structures on the square include the fourth of five courthouses (ca. 1850) built for the County, the old Newberry Bank, Hotel, the Opera House, and the Confederate Memorial Monument. Most of the brick commercial and public buildings surrounding the square were built between 1850 and 1900 when Newberry was an important stop in the railroad route from Columbia to Greenville. The first district boundary increase consisted of fifteen early twentieth century commercial, public, and religious buildings which support the nineteenth century buildings in the core district. Three of these “new” buildings were designed by prominent architects: Frank P. Milburn designed the (fifth) Newberry County Courthouse, James Knox Taylor designed the old Newberry Post Office, and Reuben Harrison Hunt designed the Central Methodist Church. The second boundary increase included an additional fourteen contributing buildings built between 1907 and ca. 1940 during a period of commercial growth and development in the city. Notable architectural styles in the district include Greek Revival, Romanesque Revival, Neo-Classical, and Art Deco, in addition to typical brick commercial buildings with traditional storefronts and decorative upper facades.